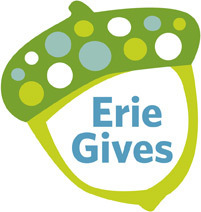 Erie Gives is an online fundraising event held through The Erie Community Foundation to benefit non-profit organizations in Erie County, including the Mercy Center for Women and Dress for Success Erie. All gifts will be matched on a prorated basis from generous local sponsors! Your donations to the Mercy Center for Women benefit the homeless women and children that we serve, as well as our partner, Dress for Success Erie. Thank you!